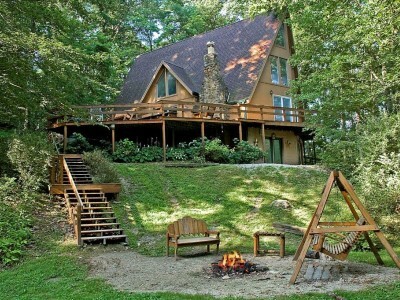 Come to Brown County and kick back for a while in this comfortable cabin with lots of great features. A soaring cathedral ceiling and a huge wall of windows looking out to the wooded surroundings creates a peaceful atmosphere in the big living room. A pretty fireplace, a flat-screen TV, and comfortable sofas will entice you to sit and chill with your family and friends. The ample kitchen has all the conveniences you could ask for, and also opens onto a deck out back. Take advantage of nice weather by enjoying the deck’s picnic table, and other seating arrangement of chairs and tables. The hot tub is located here as well, and it all overlooks a neat little pond and campfire pit area below. The main floor of Laguna House has two bedrooms, with a shared bathroom. You’ll find a king bed in one bedroom, and a pair of twin beds in the other. Upstairs is a large master bedroom with king-size bed, chaise longue, and another flat-screen TV, just in case you have to get your late-night late show “fix”. Also located on the second floor is a bathroom plus a loft area that’s outfitted with a game table, TV, and a rocker strategically placed to make the most of the pretty view outdoors. Billiards enthusiasts will be happy to know that a pool table is on the lower level, where you’ll also find a door for easy access to the fire pit and the pond. Fishing is a pastime enjoyed by many while staying at Laguna House…maybe you’ll like it, too. Other nearby activities you may want to investigate are line dancing at Mike’s Country Music & Dance Barn; horseback riding or mountain bike riding in Brown County State Park; Yellowwood State Forest; horse-drawn carriage rides in Nashville; or a performance at the Brown County Playhouse. Many shops, artist’s studios & galleries are also lots of fun to explore for the perfect souvenir of your Brown County visit. Laguna House is ready and waiting to make you feel right at home…so why wait? Book your reservation with Hills O’ Brown Vacation Rentals today. Children are welcome, however we do remind parents that they are responsible for their safety, especially around the decks, pond, and the creek.